The ALMYRAS-Project deals with ancient copper production on Cyprus. 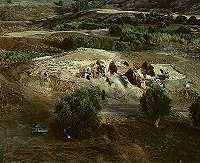 The excavated installations and finds come from the most complete productive chain in ancient Cypriot copper metallurgy. The project is a joint-venture between the Archaeometallurgical Project of Agia Varvara-Almyras in Cyprus, the Swiss National Foundation for Scientific Research and the Federal Laboratories for Materials Testing and Research (EMPA). Apart from these institutions, the project is largely sponsored by private donors and serves as a platform to individuals and companies to engage in the research of history of technology in combination with cultural animation, incentive travelling and the sensibilisation of the public for the protection of cultural heritage. The excavation can accommodate visitors in its own premises in the traditional Cypriot village of Alambra.